After running the first part of this series a couple of beautifully made big scale Ki-44 models have appeared built as on-line and magazine reviews where the primary source evidence from the 'Rikugun kokuki tosou kitei' is disregarded in favour of opinion and/or the ubiquitous internet research. This resulted in the cockpits being painted in a beautiful metallic blue ersatz 'aotake' in one case and a home-brewed bright apple green in another (based on a verbal description of colour from the memory of someone about a different type of aircraft). Lovely to look at these colours and again no problem whatsoever with the personal choice. But big problems with the fact that they were being promoted as any kind of informed choice - other than that of the "nobody really knows" type. The requirement to paint cockpits dark blue-grey lasted until mid-1943 whilst the Type 2 was being manufactured (in all forms, including prototype) from August 1940 to January 1945. There is a clue therefore that a goodly proportion of the type up to and including mid-production were probably finished to comply with the requirements. This takes the possibility of a dark blue-grey interior into the realms of the coded serials batch 1271-1309 manufactured during June 1943. The revised 'Rikugun kokuki tosou kitei' (Army aircraft painting regulations) of 14th June 1944 ordered the use of JAAF paint standard colour # 7 Ohryoku nana go shoku (黄緑七号色 - yellow green no.7 colour) for the painting of the upper surfaces of all Army aircraft including the cockpit interior and drop tanks. It also discontinued the requirement for the dark blue-grey and 'aotake' primer on other internal parts of the airframe in the interests of expediency. These instructions were not implemented immediately and factory painting of most types did not begin until August or September 1944, and even October for the Hayate production lines. 'Ohryoku nana go shoku' is perhaps one of the least understood and potentially most confusing of the JAAF paint colour standards, even causing a long puzzled Shigeru Nohara to state his preference for describing it as "dark khaki brown" - and ignoring the official designation - in his recent monograph on the Ki-44. In the past it has also been referred to as "late war brown", "deep brown green" and "Homeland defence khaki" - all intended to be one and the same colour - or perhaps more accurately the same colour standard. These descriptions tend to conceal the strong olive green chroma that was prevalent in the colour standard, although the procured and applied paint varied as we may see. In practice the permitted range of this colour imitated US Olive Drab but is perhaps best described as an olive brown, extending from a deep brownish olive green to a drab khaki brown. In colour terms the range is from Munsell 2.5 Y 3/2 to 7.5 Y 3/3. The closest FS 595b equivalent to both these values is conveniently 33070, @ 4.69 for the "brown" 2.5 Y 3/2 and 2.37 for 7.5 Y 3/3 (the slightly different readings above relate to the difference calculation between the respective pure sRGB values). Therefore this FS value is biased towards the greenish end of the range and 33070 is not quite brown enough for the brown end of the range. The bright orange and reddish browns that appear on some models (and profiles) intended to replicate this "late war brown" are largely flights of fantasy. Conducting an online search for yellow-green colour (黄緑色) in Japanese language clarifies Nohara-san's confusion, because it will bring up many images of what can be described as a pea green colour - a strongly yellowish green. These are similar to the sickly yellow greens of JAAF # 29 yellow green colour (also 黄緑色 but often romanised as ki midori iro). This potential confusion may explain the qualifier No.7 (七号) always used to differentiate the olive brown colour. Extant artifacts and paint surface colour measurements confirm that # 7 was applied inside cockpits on several types (such as the Ki-45 and Ki-67). 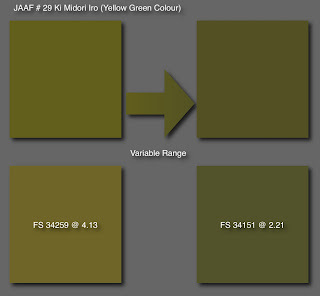 However, whether there was some confusion in the understanding and implementation of this order or in its intention, another JAAF # 29 yellow green is also found inside the cockpits of Nakajima Ki-43, Ki-44 and possibly other aircraft, particularly during the mid-war period (so the practice might have preceeded the June 1944 instruction). The measurement of one example of yellow green from the interior of Hayabusa 5227 matches this colour almost exactly. The closest Munsell equivalent is 10 Y 4/4 and the closest FS 595b match to that is 34151 @ 2.15 (but not quite yellow or chromatically strong enough). Curiously the latter FS value has also been cited in respect of Mitsubishi-built Zero cockpit interiors. This interior colour has been described variously (primarily in Hayabusa cockpits) as a "Nile green", "sickly green","yellowish olive green" and "bilious green". 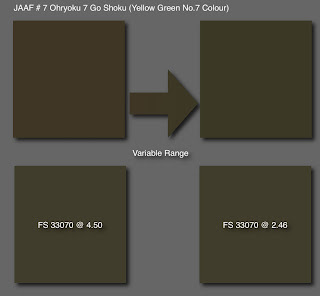 A dull and weathered version may be the basis for the "khaki green" suggested by Hasegawa for its 1/32nd Shoki model but there is no way of knowing if this suggestion is for a variation of # 7 (and I have not checked out the hobby paint colour cited). Early 1960's representations of a distinctive "oily green" finish on the cockpit, wheel wells and the inner faces of the undercarriage doors on Shoki may be attempts to depict variants of # 29. A recent theory supposedly emerging from Japan, that during the early period of the war Army cockpits may have reverted to an aotake finish (青竹色 - literally blue green bamboo colour - or sometimes written as 淡青色透明 - literally thin, translucent, light blue colour), seems to be based upon the evidence of paint colour in the restoration of surviving Hayabusa s/n 750. The available documentation about the restoration (excerpted below) is somewhat ambiguous and, bearing in mind the official instructions and previous comments about how degraded examples of # 3 can appear to the eye and not taking single examples as proof of a standard methodology, this theory seems a little tenuous. "A full surface corrosion removal (of Hayabusa s/n 750) was undertaken. Fortunately corrosion had not got a good hold on this aircraft and most was buffed off using Scotchbrite buffing wheels. The wash also brought the internal corrosion proof paint up beautifully. The colours inside now were brilliant green with some blue panels, and where it had not been exposed to ultra violet light, had proven itself to be extremely effective in its performance. The interior skins were remarkably well preserved. We were able to duplicate the colours fairly accurately and decided that a deoxidene and alodeine wash would be appropriate before any new paint application to ensure future preservation of the original skins. Later in the year areas which did show surface corrosion were buffed to remove corrosion and the above washes were applied before the final paint." "Inside the flap bays, the corrosion inhibitor again had served the Oscar well, the translucent green protecting against deterioration and this required no rework at all apart from cleaning. It is of interest to note that internal skins inspected were hand numbered 750, from time of manufacture as were the fuel tank bays. " Gakken 52 on the Hayabusa states that whilst the prototype and pre-production versions of the Ki-43 had the cockpit interior finished in ash indigo colour, (hai ran shoku or hai ai iro 灰藍色) the production aircraft had the whole interior, including the cockpits and wheel wells, finished in aotake. Majoring on the Ki-44 for the time being, which seems to be the flavour of the month, we do have some interior photographs to consider. The cockpit photographs of s/n 2143, captured at Clark (and manufactured during October 1944), are fairly well known, but a new Japanese photograph, of the port side of the cockpit of another Ki-44 with the pilot's gloved hand on the throttle, appears on page 33 of Scale Aviation # 70 (Nov 2009). Now, I am not about to attempt that dark and fallacious art of interpreting colour from monochrome photographs, but at least the paint surface may be seen to be darkish in tone and opaque in character with the usual chips and scratches suggestive of a conventional paint finish subjected to the trials and tribulations of service use. There is not the barest hint of the brightly reflective, translucent, metallic-looking surface finish suggested by the restorations of Hayabusa s/n 750 or the NASM J1N1-S Irving. 4. Translucent yellow-green aotake as a possibility on some mid-war examples. The last part of this series will explore the colours specific to Kawasaki manufactured aircraft. Please post a scan of the 1978 Maru magazine Shoki interior painting you mentioned. Very-very interesting. Can I also see those Maru Magazine painting instructions, please? Could you, please, advice on the cowling interior color of Wakamatsu's Shoki, as pictured in a splendid profile in your blog on 26.12.11? If I choose to paint cockpit JAAF # 29, should I paint cowling's inside the same color, or should it be aotake or even bare metal? I think a Ko model is more likely to have had a blue-grey or even aotake interior. I would suggest using # 29 on later model Ki-44 such as Hei. The blue-grey primer was also used for undercarriage wells and inside flaps, etc., so might have been painted inside cowlings. But some extant evidence suggests that a very dark grey or black paint was also used, similar to the anthracite colour mentioned in my blog post of 26 March 2012. I think even with # 29 cockpit colour the cowling interior would be blue-grey, dark grey or black. Thank you so much! Your kind assistance is very timely!